As everyone knows, the ladies in the school office at WPS are tops! If it's things like helping us order supplies, manage the budget, organize school events or provide our students with yummy apples or a needed bandaid, they always do it with a warm smile and caring attitude. We want them to know that their countless responsibilities and efforts on behalf of our students, parents and staff are very much appreciated. 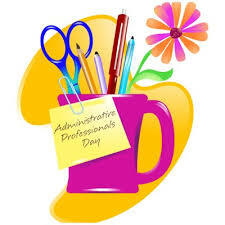 April 26th is Administrative Assistant Day and our opportunity to give Sylvia, Cheryl and Reannon a big thank you for all they do to keep our school running and our students and staff safe and happy! If you see them in our school office or speak to them on the phone this week, please help us say THANK YOU! Character Assembly for "Empathy" and "Optimism"
Backwards Spirit Day Friday April 28th! Scientist in the School for Gr. 1-3 is coming! We're getting an Outdoor Classroom!! Happy Easter and Good Friday! School Council Meeting April 19th 7:00 p.m. Such fun at Family Math Mania! Day of Pink April 12th at WPS! April is FAMILY LEARNING Month!